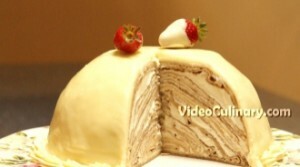 Make this beautiful half-sphere 20 layer crepe cake, filled with a simple white chocolate ganache frosting. 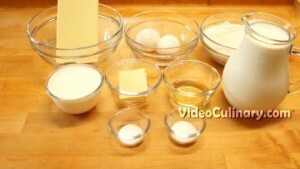 Make the white chocolate ganache frosting: Chop 400 grams (14 oz) of white chocolate and place in a bowl. Bring 600 ml (20 fl oz) of heavy cream to simmer, and pour over the chocolate. Stir until smooth and the chocolate has completely melted. Cover with plastic wrap and refrigerate for at least 5 hours. 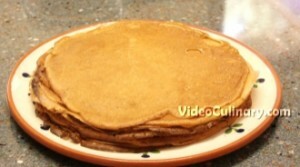 Make the crepe batter: Combine 2 eggs, ½ teaspoon of salt and 1 teaspoon of sugar in the bowl of a stand mixer. Mixing on low speed, add 350 ml (12 fl oz) of milk. 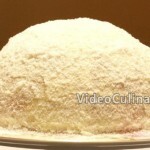 Add 280 grams (10 oz) of flour and mix until smooth. 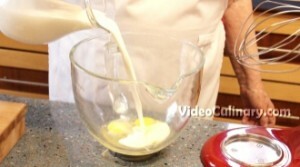 Scrape down the sides of the bowl, and add another 300 ml (10 fl oz) of milk and set aside for 20 minutes. After 20 minutes, scrape down the sides of the bowl and mix the crepe batter for 2 minutes. Strain and add 2 tablespoons of oil. Heat the pans, grease lightly with butter, add a small amount, about 40-50 ml of the batter, and swirl the pan. Cook over medium heat until golden. 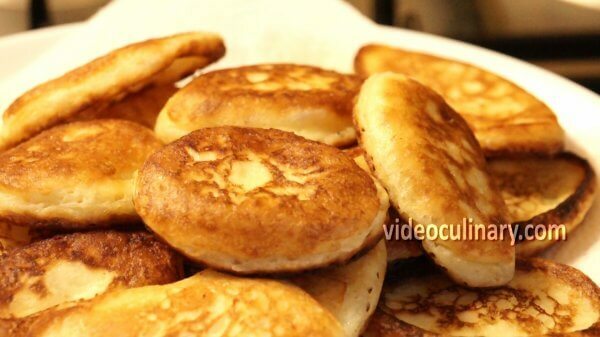 Use a skewer to flip the crepe, cook for a few seconds on the other side and remove from the pan. 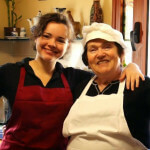 This amount yields about 20 crepes of 25 cm (10 inch) in diameter. Remove the white chocolate ganache from the fridge. 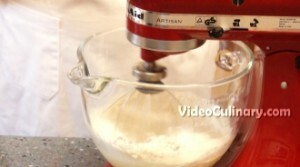 Transfer to the bowl of a stand mixer, and whip on high speed until stiff. Be careful not to over-whip the ganache. 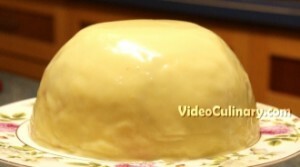 Use a bowl of 20 cm (8 inch) in diameter to assemble the cake: Line the bowl with 4 crepes so that they overlap each other, and overhang the rim by 2 cm (1 inch). Spread a thin layer of the white chocolate frosting, using the back of the spoon. Place one crepe on top of the frosting. Spread a thin layer of the frosting, and continue this pattern. 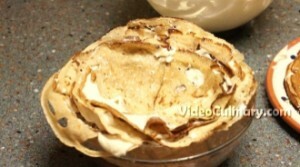 To fill the hollow center of the bowl, spread a thin layer of frosting on top of a crepe. 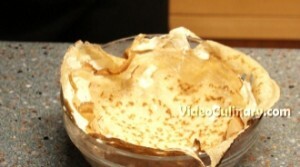 Fold the crepe into a log shape, or fold in half, and in half again – creating a triangle. Place 4 crepe triangles on top of the frosting. Spread a thin layer of cream over the top. Continue until you are left with 2-3 crepes. Reserve some of the frosting to cover the cake. Fold the overhanging edges inward. Place 2-3 crepes on top of the bowl. Place a cutting board or a plate on top, and invert. Press the bowl lightly to compact the layers. Refrigerate for at least 4 hours. 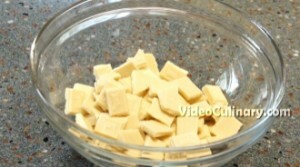 To make the white chocolate glaze, chop 250 grams (9 oz) of chocolate and place in a bowl. 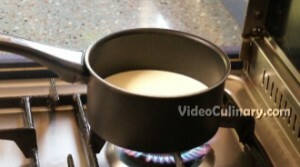 Bring 150 ml (5 fl oz) of heavy cream to simmer, and pour over the chocolate. Stir until melted and smooth. 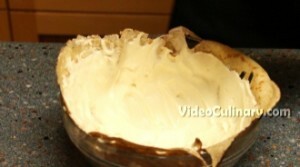 (If your chocolate has not completely melted – place the bowl over gently simmering water, and stir until smooth). You can cover the cake with a glossy caramel glaze, or a chocolate mirror glaze. 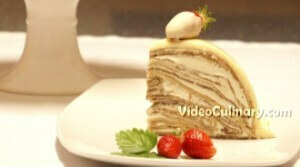 Remove the crepe cake from the fridge; trim any excess crepe and frosting. 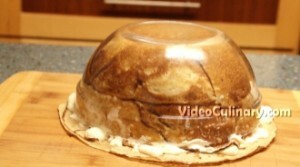 Invert, use a knife to release the cake from the bowl, invert again and remove the bowl. Ice the cake with the remaining white chocolate frosting; use a spatula to smooth the surface. Place in the fridge for a few minutes. 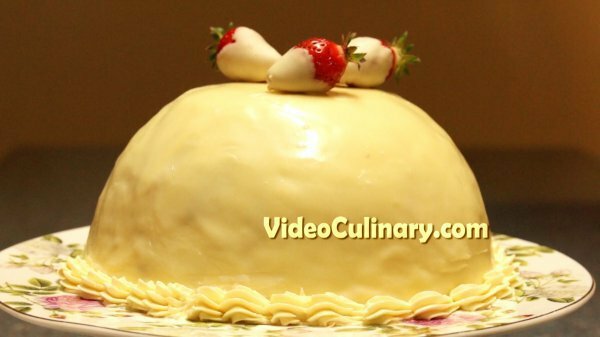 The white chocolate glaze should cool to room temperature, but still be runny enough to pour over the cake. (If the glaze becomes too thick, reheat it over simmering water or in the microwave for a few seconds). Place the cake over a rack set over a sheet tray, and pour the glaze onto the center of the cake. You could use any leftover white chocolate glaze again by straining it and warming it up in a bowl over simmering water. Place the cake in the fridge, until the glaze sets. 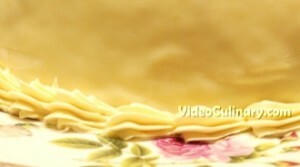 Pipe a shell border at the bottom of the cake using a pastry bag fitted with a small star tip. Dip a few strawberries in white chocolate, place on parchment paper and refrigerate for a few minutes until set. Place on top of the cake. 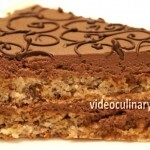 Serve this beautiful cake with tea or coffee. 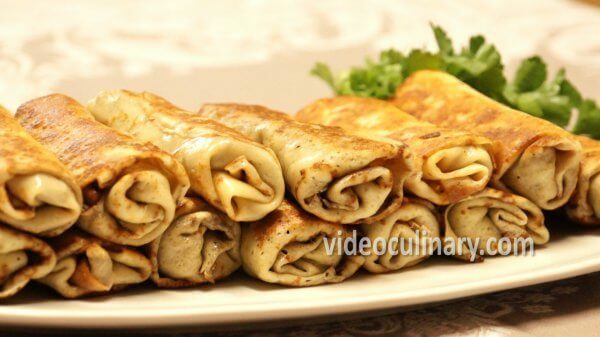 You will find more crepe recipes on our website. Enjoy!